Jihosoft Android Phone Recovery is a popular Android data recovery tool that works on almost all the popular Android devices. Since the tool can help us recover our lost or inaccessible data in different scenarios, it is widely used the world over. If you also wish to perform a data recovery on your Android phone and would like to know more about Jihosoft Android Phone Recovery, then you have come to the right place. I have used the tool myself and have listed its pros and cons right here. Read on and get to know about the in-depth Jihosoft Android Phone Recovery review. Part 2: How to use Jihosoft to recover data from an Android phone? Part 5: Why dr.fone is the most decent competitor to Jihosoft Android Phone Recovery? Jihosoft Android Phone Recovery is a dedicated tool developed by Jihosoft to recover data on Android devices. 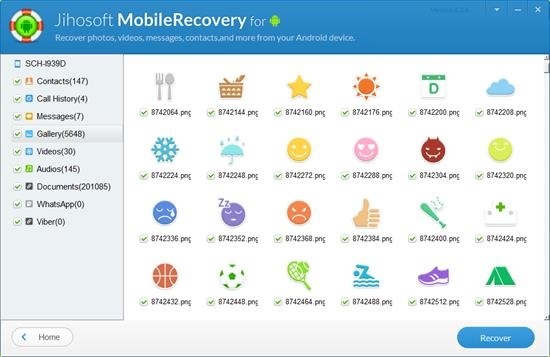 By using its data recovery application on your Windows or Mac, you can retrieve the lost and deleted content on your Android device. The tool is quite easy to use so you won’t face any trouble recovering data from your phone. To start our Jihosoft Android Phone Recovery review, let’s see its major features. What kind of data can it recover? It can recover all the major kinds of data such as messages, contacts, photos, audios, videos, call history, important documents, WhatsApp data, and Viber data. The data recovery is performed in all the major scenarios. For instance, if you have accidentally deleted your data, it has been factory reset, data is lost due to a malware attack, and so on. Users can have a preview of the recovered data so that they can select the content they wish to retrieve. It provides an extensive compatibility with all the major Android devices. As of now, all the devices running from Android 2.1 to Android 8.0 are supported. This includes devices manufactured by brands like Samsung, LG, HTC, Sony, Huawei, Motorola, Xiaomi, etc. Currently, the personal edition of Jihosoft Android Phone Recovery is available for $49.95, which can be used on 1 PC and 1 Android device. The Family Edition is available for $99.99, which supports 5 devices (and 5 PCs). It is available for both, Windows and Mac. The Windows versions are supported for Windows 10, 8, 7, Vista, 2000, and XP. On the other hand, Macs running on macOS 10.7 or later versions are supported. The tool is quite lightweight and has extensive compatibility with all the leading Android devices. Anyone can use it to perform data recovery without any prior technical knowledge. In order to recover your data, you need to root your Android device. This can be a deal-breaker for many. The tool can’t recover data from a broken or damaged device. The success rate of data recovery from a bricked phone is not that impressive. Too often, users complain that the Jihosoft Android Phone Recovery is not working out of the blue. While working on this Jihosoft Android Phone Recovery review, I found the application pretty easy to use the tool. Though, if your device is not rooted, then you might have to go through some unwanted hassle. Also, before you proceed, make sure the USB debugging option on your phone is enabled. To do this, go to your phone’s Settings > About Phone and tap on the “Build Number” seven consecutive times. This will unlock the Developer Options on your phone. Later, go to its Settings > Developer Options and enable the “USB Debugging” feature. Once it is done, you can follow these steps to use Jihosoft Android Phone Recovery. Download and install Jihosoft Android Phone Recovery on your Mac or Windows computer. Launch it whenever you wish to perform a data recovery on your phone. To start with, you need to select the category of content that you wish to scan. If you are not sure, then you can select the “All” option as well. Now, connect your Android device to the system. Just be sure that the option for USB Debugging is enabled. Give the application some time to detect the device automatically. Once your device is detected, you will get the following screen. Click on the “Start” button to initiate the process. You would have to wait for a while as the application would scan your device and look for any inaccessible data. As soon as the scanning is completed, the application will display the retrieved content in different categories. 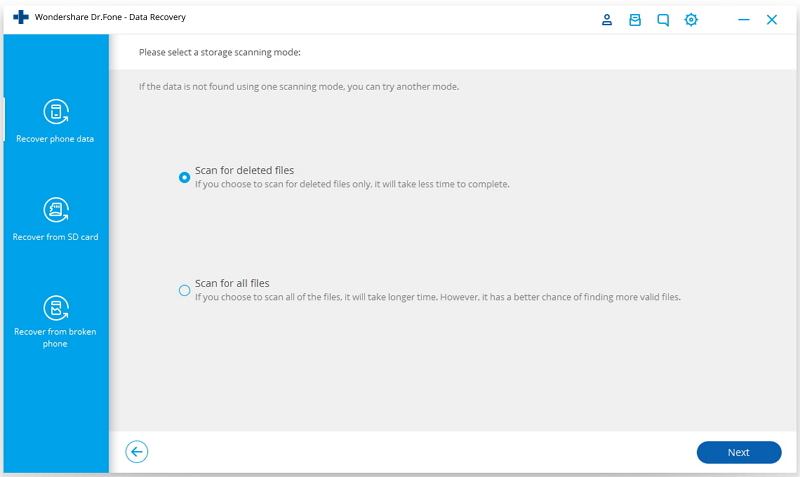 From here, you can preview the retrieved data, select it, and recover it. Now when you know our in-depth Jihosoft Android Phone Recovery review, let’s get to know what others are saying about it. Here are some of its genuine reviews so that you can know about the experience of other users as well. A lot of people complain that Jihosoft Android Phone Recovery not working or that their phone is not being detected by it. If you are going through the same, then read these frequency asked questions about it. 4.1 Is it necessary to root the phone before using Jihosoft? Yes, you need to root your device in order to use Jihosoft Android Phone Recovery. This is because after rooting, the application would be able to have a complete control over the phone. Therefore, you need to root your phone before using the application. Though, you should know the repercussions of rooting your device first. It will void the warranty on your phone and might make it vulnerable to security threats as well. 4.2 Can I recover data from a broken Android phone using Jihosoft? 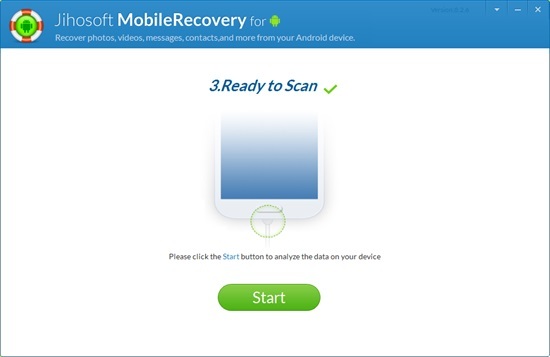 No, Jihosoft Android Phone Recovery can only let you recover data from a working device. If your device is broken or damaged, then the application would not be able to access its storage. This is one of the major drawbacks of the application. 4.3 What if my device is not detected by Jihosoft Android Phone Recovery? There could be plenty of reasons for Jihosoft Android Phone Recovery not working or the device not being detected by it. Try these suggestions to fix it. Make sure that you are using an authentic cable and that the port on your device is not damaged. You can disconnect your phone, restart your computer, and connect it again. Also, you need to enable the USB Debugging option on your phone before connecting it to the system. Check if the device is being detected by the system or any other application. The device should be compatible with Jihosoft Android Phone Recovery tool. Due to its limitations, a lot of users look for Jihosoft Android Phone Recovery alternatives. One of the best data recovery tools that you can try is dr.fone – Recover (Android). Since I was not satisfied with the Jihosoft Android Phone Recovery results, I tried the dr.fone toolkit. Needless to say, it performed beyond my expectations and allowed me to recover all kinds of data from my Android device. It is the first Android phone data recovery software and is known to yield the highest success rate in the industry. Unlike Jihosoft, you don’t need to root your device to recover its data. It can also perform an extensive data recovery even if your Samsung phone is broken or damaged. Here are some of its other features. You can recover data from your phone’s internal storage, an SD card, and even from a broken device. 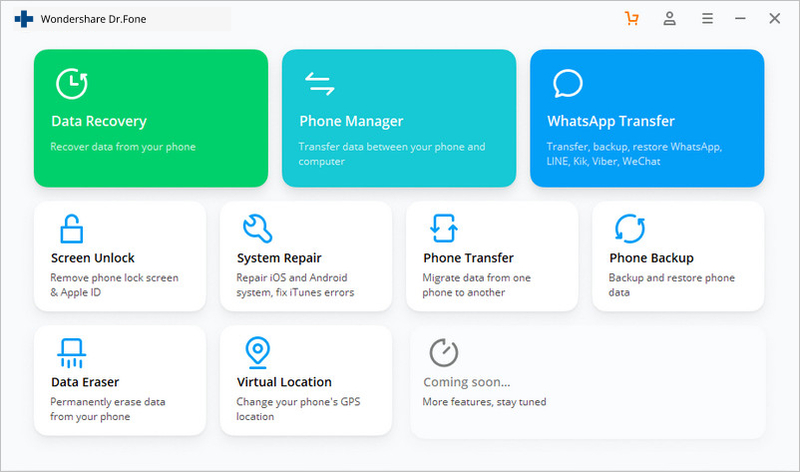 It can recover all kinds of data on your device, like photos, videos, audios, contacts, messages, call logs, important documents, WhatsApp attachments, and so much more. 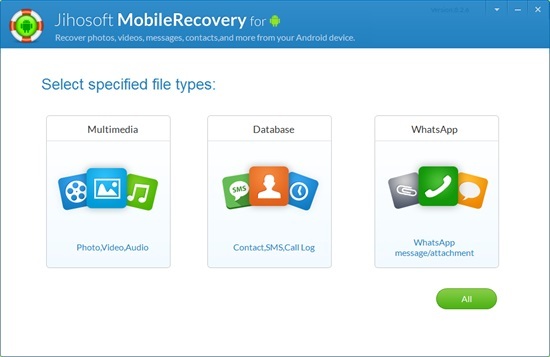 With so many features to offer, dr.fone – Recover (Android) is certainly a must-have data recovery tool for all. Here’s how you can use it to recover data from your phone. 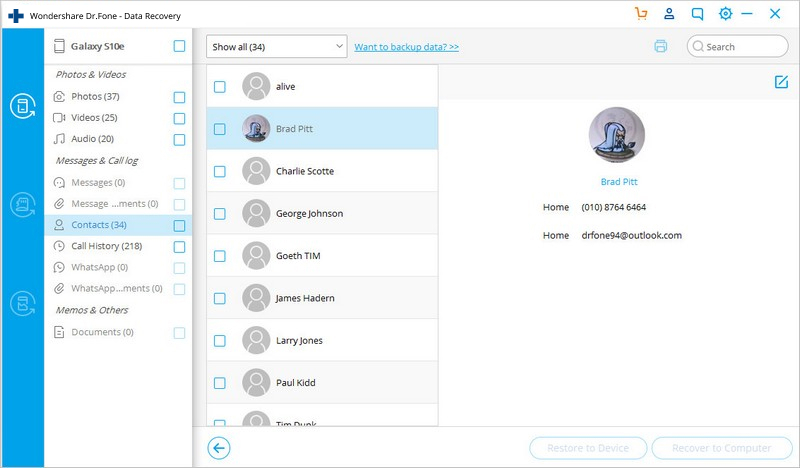 Install dr.fone – Recover (Android) on your Mac or Windows PC. 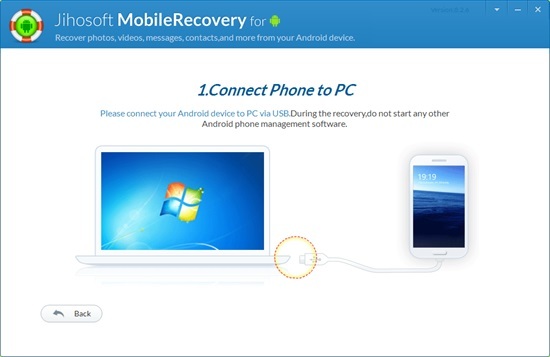 Launch the dr.fone toolkit and visit the “Recover” module from its welcome screen. Connect your device to the system and wait for it to be detected automatically. Before you connect it, just enable the USB Debugging option by visiting its Developer Options. Once your device is detected by the application, choose whether you wish to recover data from a phone’s internal memory, the SD card, or if the device is broken. Let’s suppose we have to recover data from the device’s internal memory. Now, you need to select the type of data that you wish to recover. If you wish to perform a comprehensive scan, then select all the data types and click on the “Next” button to continue. From the next window, you can choose if you wish to scan the entire device or simply look for the deleted data. While it will take more time to scan the entire device, its results would be far better as well. If you have less time, then simply scan for the deleted content on your phone. Wait for a while as the application would analyze the device and check its important details. In no time, it will start the data recovery process. Simply wait for a few minutes as the data recovery process will take place. Make sure that your device is connected to the system as the process is going on. Once it is completed, you will be notified. The recovered data will be segregated into different categories. You can just visit a category from the left panel and preview its content. Select the type of content you wish to retrieve and click on the “Recover” button. That’s it! By following this simple click-through process, you would be able to retrieve your lost, deleted, or inaccessible content. With dr.fone – Recover (Android), you can perform an extensive data recovery on your phone’s internal memory as well as its SD card. It can also recover data from a broken Samsung phone as well. There’s no need to root your device too. 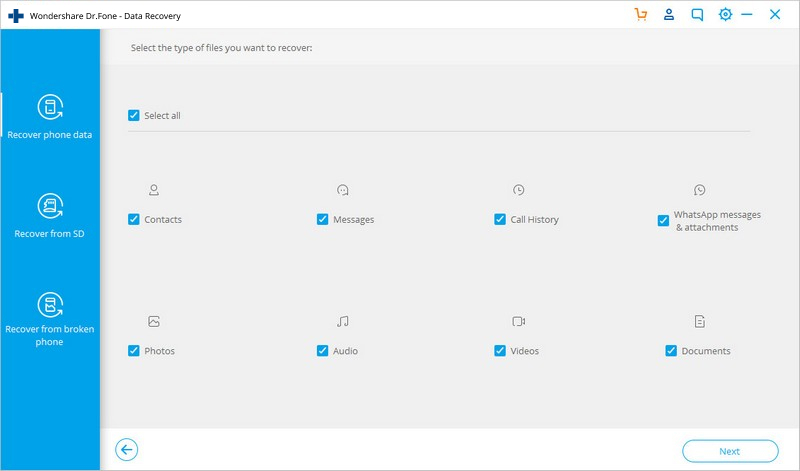 With so many features, dr.fone – Recover (Android) is certainly an essential data recovery tool that every Android user should keep handy.